Perhaps it’s the Food Network show The Great Food Truck Race, paired with childhood memories of the sound of the ice cream truck, that has spurred the growing interest in food trucks nationwide. Whatever the reason, this is one rash outbreak that we’re thrilled is spreading here in Winston-Salem. Camel City Grill food truck made its debut at the Burke Street Food Truck Festival in April 2013. Owner Ben Devar has been serving up interesting angus beef burgers and sandwich favorites ever since, including their Ben’s Pimento Cheese Burger, made with local Uncle Chris’ pimento cheese, the PBBJ Burger with pepper jelly, bacon and homemade peanut butter; and their newest addition, the Hangover Burger. Definitely give the fried okra a try. Find them set up around town at locations like Krankies Airstream, Old Winston SocialClub, Milton Rhodes Center for the Arts and near Dash games. Follow them on Facebook and Twitter to find out their daily location. This amazing truck with authentic Puerto Rican delights out of Greensboro really gets around the Triad, and sometimes parks at Jugg Heads on Country Club Rd. Check the Empanadas Borinquen Facebook page for their weekly location schedule and plan your attack on fresh empanadas, pernil, mufongo, Cuban sandwiches, arroz con gondules and more! This truck is all over town with BIG gourmet burgers and dogs, like their Dirty South Burger with collards, bacon jam and white sauce, and interesting pumpkin spice cream cheese burger! Find them often at Downtown Winston-Salem Food Truck Fridays at the corner of Fourth and Broad, Jugg Heads Growlers, and other locations! Check the Food Freaks of NC Facebook page for their schedule. Forno Moto, is a wood-fired pizza truck specializing in neapolitan-style pizza, was recently voted Best Food Truck in Winston-Salem by Smitty’s Notes Fans. Their Margherita pizza was a huge hit at Rock the Block Downtown. Keep an eye out for Forno Moto at special events around town and their brick-and-mortar location now under construction on Trade Street downtown. You can also visit their newly added brick and mortar location at Mission Pizza on Trade Street (shares a parking lot with Mary’s Gourmet Diner). 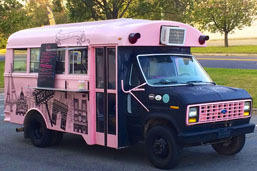 One of the newest (and prettiest) food trucks on the scene is the La Vie en Rose Food Truck, where an authentic French chef serves up both sweet and savory crêpes and other French specialties. One of our favorites is the French Cowboy crêpe, and the French Monkey crêpe with nutella and bananas for a sweet finish! Find them often at Bailey Park, in front of the Milton Rhodes Center for the Arts (some Wednesdays) and at Krankies Airstream on Reynolda most Saturdays. Follow them on Facebook for locations. 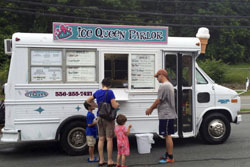 The Ice Queen is a mobile ice cream parlor from Greensboro that frequents Winston-Salem events. Choose from classics like the Rocket Pop or a cone of one of eight flavors of Edy’s ice creams, but we recommend her ice cream sandwiches. Pictured here is The Elvis: banana pudding ice cream and Reese’s peanut butter ice cream between two chocolate chip cookies! Another favorite, King-Queen Haitian Cuisine boasts the best sellers: seasoned fried pork and poulet frite, as well as jerk chicken, fried plantains, and more. 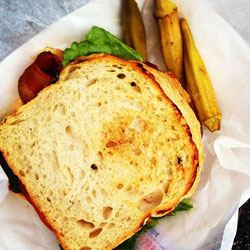 Find them often at Downtown Winston-Salem Food Truck Fridays on the lot at the corner of Fourth Street and Broad. A newcomer to the Winston-Salem food truck scene that’s filling a gap is the Livin’ Good Pizza Truck. Find them often at Jugg Heads Growlers & Pints on Country Club Rd, near Wake Forest University at Last Resort during games, and other Winston-Salem locations, Livin’ Good truck serves up some interesting pizza flavor combinations like barbecue chicken pizza, cheeseburger pizza, spinach feta with banana peppers and olives, and philly cheesesteak sandwiches and more. Italian ices made locally with real fruit and fruit juices. We especially love mango, watermelon and rainbow! Find this Italian ice truck often at Krankie’s Airstream. Several yummy flavors and generous portions for the price! Serving “fresh Cuban food,” this busy food truck rolled onto the street food scene in 2017 serving empanadas, fried plantains, croquetas, yucca fries, chicarrones and more. They also offer catering. The truck currently boasts a “100” health score. You can find them around town at West Salem Public House, Juggheads, Southside Beer Garden and special events. Check their Facebook page for a monthly calendar. The endeavor of Chef Kevin Riddick, formerly of Artisan restaurant (now closed), Screaming Radish offers local farm-to-truck foods in gourmet fashion, as well as catering options. For menu and location stops, visit the Screaming Radish Facebook page. If you’re looking for authentic Mexican cuisine in a local food truck, look no further than the popular Taqueria Luciano’s. Luciano Flores hails from Vera Cruz, Mexico. You’ll find burritos, tacos, quesadillas, tortas, chorizo, chicharrones and other Mexican delights on the menu. Most Wednesdays and Saturdays, you’ll find Taqueria Luciano’s at Krankies Airstream/Coffee Park on Reynolda Rd. Bandito Burrito out of Greensboro is a frequent visitor of Winston-Salem and we love their chicken tacos, Korean barbecue burritos and nachos. Taqueria El Aztecais another Greensboro taco truck that frequents Winston-Salem, lauded for their fresh guacamole and more. We’ve also heard great things about Lonchera El Zapopan taco truck from a friend who loves their steak tacos with fresh radishes, cilantro and green salsa. Find them at Cooks Flea Market and late night at Disco Rodeo bar on Waughtown St. King Creole Louisiana Food Truck from Burlington and Urban Street Grill (Korean bbq truck), from Greensboro, frequent Winston-Salem as well. For something different, this Greensboro food truck often brings its popular Korean barbecue to Winston-Salem. Another favorite is the Ginger Chicken Bowl. A newcomer to the local food truck scene is Village Juice Company, where the locally cold-pressed juice is the food! Their green juices are particularly popular. Find them often at Krankies Airstream and Cobblestone Farmers Market on Saturdays in season. The inaugural Burke Street Food Truck Festival in April of 2013 was such a success, that it has grown by leaps and bounds! The Third Annual and most recent Burke Street Food Truck Festival was bigger than ever on Saturday, April 11, 2015. The 2016 Burke Street Food Truck Festival will be held Saturday, April 9, 2016. While the first BSFTF three years ago boasted 13 food trucks and drew a crowd of 3,000, in only three years, it has grown to more than 30 food trucks and a crowd of 12,000 to 15,000. This growth has included the Festival’s footprint, which now encompasses all of Burke Street and bleeds out into the side streets with four stages for music and a kids play area. Food trucks came from around the Piedmont and brought amazing food that included creole dishes, Caribbean, tacos, turkey legs, crepes, burgers, noodles, barbecue, cupcakes, ice cream, barbecue and more. Restaurants on Burke Street and nearby did not complain, as they enjoyed the overflow diners from the Festival. The event was organized by caring (unpaid) citizens Susan Morris, Reggie Delahanty. The two simply love food trucks and the downtown scene, and they wanted to bring some notoriety to the Burke Street area businesses. The lines were long, but a beautiful day allowed for socializing with friends and neighbors. The Fourth Annual Burke Street Food Truck Festival will be held Saturday, April 9, 2016. For more details, follow along on Facebook. The Vineyards mobile food truck is another that’s brand new on the scene. Currently, it serves food at West Bend Vineyards and Winery on Wednesdays and Thursdays and Sundays from noon to 5PM, Fridays and Saturdays from noon to 8PM. 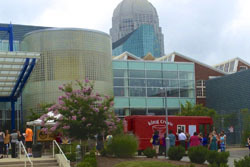 We’re hoping it will soon venture off the grounds to downtown and other Winston-Salem events! Find another great local food truck? Let us know! Hello, I am looking to open up a dessert type concession trailer, but wanted to do some research and see if it would even be welcomed in Winston Salem or if I would find it hard to find places to set up shop. Do you know who I should contact? Thank you. Some of the regular set up spots we recommend you reach out to include Krankie’s Airstream/Coffee Park, Bailey Park (during special events), Jugg Heads Growlers, and Downtown Food Truck Fridays (contact Downtown Winston-Salem Partnership) and Burke Street Food Truck Festival. They are all great supporters of the local food truck scene! Best of luck! We are not sure but it is likely that the Burke Street Food Truck Festival organizers can help answer your questions. If you go to their Facebook page, (https://www.facebook.com/BurkeStreetFest ) and send them a message, we feel certain they would be happy to help! Good luck and keep us posted if any new trucks/routes get added so we can keep everyone updated! I am potentially coordinating a Food Truck event for my company and researching available Food Trucks in the Winston-Salem area. I am still somewhat new to the area. I am interested in trucks that are preferred, those to avoid, etc. As you may know, there doesn’t appear to be one location for this information or even contact details (a shame). I thought you may have some advice or suggestions? In the article I mention the Burke Street Food Truck Festival. If you go to their Facebook page, (https://www.facebook.com/BurkeStreetFest) they list many of their food truck vendors and even hot link their names to their Facebook pages, where you can grab their contact info. There are a few here in Winston-Salem, like Camel City Grill (https://www.facebook.com/camelcitygrill?directed_target_id=0) but others often come to Winston-Salem from Greensboro, Burlington and even Durham. I hope that helps! Good luck on your event! Thank you, I will check that out, our work blocks Facebook, but I am sure I can try from a different location. Thank you for the quick response. I am potentially coordinating a Food Truck event for my company and researching available Food Trucks in the Winston-Salem area. I am still somewhat new to the area (how I was “voluntold” to coordinate this, I will never know). I am interested in trucks that are preferred, those to avoid, etc. As you may know, there doesn’t appear to be one location for this information or even contact details (a shame). I thought you may have some advice or suggestions?